Everest Google Places Reviews Lite is one of the best free WordPress plugin to showcase your Google Places and business user reviews and also it allows you to display up to 3 business user reviews. The most powerful reviews display platform with 2 beautifully designed templates for business reviews with user rating and 2 beautifully designed badge templates for displaying business information more attractively and you can attach ribbon as header for each badge information with extra 2 google rated designed header templates. Simply Display your business google places reviews to attract more reviews for local business. If you have multiple business, then you can simply create multiple business location and showcase specific reviews on specific page or post using shortcodes. Effortlessly show Google Places Reviews on your WordPress site utilizing an intense and instinctive widget. This plugin is useful since you can display your google business and places information with positive reviews on websites which simply further enhance your online credibility. Options to Hide User Rating. 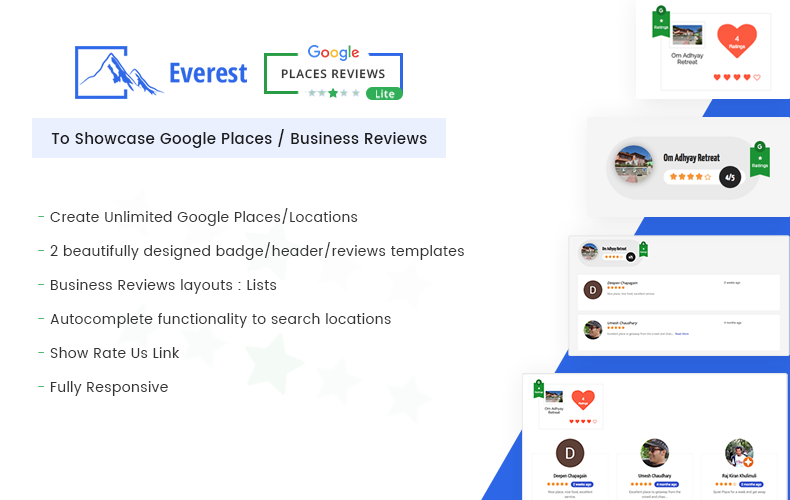 Hey Buddy!, I found this information for you: "Best WordPress Free Plugin To Showcase Google Places / Business Reviews – Everest Google Places Reviews Lite". Here is the website link: https://access-keys.com/wordpress-plugins/everest-google-places-reviews-lite/. Thank you.